A richly ebonized surface makes a bold statement on this 18th century Dutch frame design. 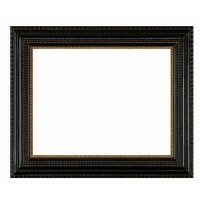 Typical of Dutch style, this frame is ornamented with highly detailed ripple patterns on the top outer and inner edges. The design flows toward the inside edge of the frame where a delicate ripple ornamentation is gilded in 22K gold.